Jom kasi pecah (the ante upped) | Ketawa ! Bergossip ! Info ! Suka-Suka ! The first time I’ve seen Aidil performed was under the moniker Bubby & Flo, at a gig organised by the students of the University of North London held at The Rocket on Holloway Road, back in 1998. 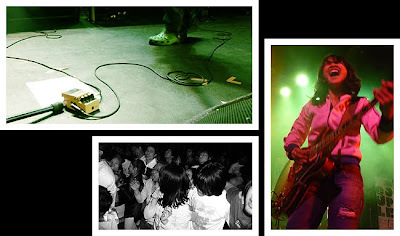 I remembered that the organisers were going on about the singer/guitarist of Bubby & Flo already having a band (with a demo or two to boot) back in Malaysia. Bubby & Flo played a chilled set of 60’s Motown-esque covers (if my memory serves me correct – also, I am not sure if they played an original tune), with Aidil playing a right-handed Epi Slash Les Paul (complete with the Snakepit logo) upside down, backed by another guitarist and a drummer. Yup, no bassist was in sight. Little did I know then that the band he fronted back in Malaysia was called Couple (in its primordial form) which would go from strength to strength in the decade to come. Fast forward twelve years later, I met Aidil again at the Academy 2 in Manchester after Couple played a fantastic set of material from three records. Couple now comprises Aidil, Ariana on guitar, Masrin (who had to return back to Malaysia due to illness in the family) on bass and Shahrin on drums. Bass guitar duties fell on a mate of ours from Manchester named Din who, on top of learning songs of the opener House of Five, had to learn 16 Couple songs in a day. I have to admire his guts as I honestly felt that Din played very well (bass lines complete with bunga, seriously) with the three remaining members of the band in their UK tour. Couple kicked off the set kinda quarter to ten-ish with Love You Yes. Jump-a-rama started early enough with the punters singing the three words of the chorus with much aplomb. 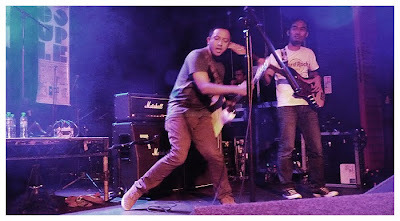 Aidil had his signature white Strat (which can be seen here), doing rawk poses naturally, whilst Ariana and her semi-hollow Ibanez was happily leaping onstage in her green Crocs onto the riser. My favourite moments of the evening was the twistastic Menarilah Hey, C’mon Operator and hard rocking Semua Tak Boleh, from their current Malay record Pop Tak Masuk Radio. “We named the record as such because no radio station would play our songs. Now the radio stations want to play them”, quipped Aidil who also translated the Malay song titles for the non-Malay speaking British members of the audience. Shahrin did a short yet impressive drum solo during the set which I regretted not recording on my point+shoot. The pogo continued on especially during Hey Kawan-Kawan, with all chanting the “Jom kasi pecah” mantra. They ended the set with the fast-paced Come Back Again. The show has less of a product placement feel to it as compared to the previous KNUKE venture. Nevertheless, it appears that KNUKE has done well with this tour which included shows in Liverpool and London, supported largely by up-and-coming local Brit acts. Also, Couple had taken their own initiative to secure two extra London club gigs, aimed for the local British crowd. A Couple song has an average time span of two minutes. It doesn’t really matter. As one would say, short and sweet, kan?